This is a female Fiddler Crab. They’re not hard to find at aquarium stores, and I’ve had more than one as pets. Interesting creatures! The males have one very large claw that is waved about (to attract the females of course.) All of them are busy, curious, and entertaining as they prowl around their tank looking for food. Unfortunately, they’re usually sold as freshwater creatures. Fiddler Crabs are brackish water animals, denizens of the intertidal zones. That makes them tough and very capable of adapting to drastically changing conditions, but they can’t do full-time freshwater or full-time underwater. No one told me this back in the day; now that I know better, I won’t have another unless I can give them the habitat they need. Definitely don’t have time to maintain a complex and delicate ecosystem in my house right now! So for now, let’s stick with painting them! Reference image is here. The crab is Raw Umber and Burnt Sienna with a touch of Raw Sienna on the front legs (all PBr7). The teal background is Cobalt Turquoise, PG50. Not a color I have used a lot, and I’m pleased that the granulation worked really well here. The shadow started as PV23 and it just looked a little weird with the teal, so I overlaid it with PB60 Indanthrone to calm it down. It’s a little less bossy now. Drawn with the Kuretake Brush pen – that’s a dream to work with for jobs like this! Got a long swooping line? Just swish! Need some dense black over a large area? Done, with a few flicks of the wrist! The brush tip is fine enough to handle the tiniest details without changing tools. Now I understand why cartoonists draw their entire strips with brushes and bottles of ink. I’ll probably never have a WN Series 7 sable brush, but totally get why someone would make the investment. The painting is much larger than the actual crab! 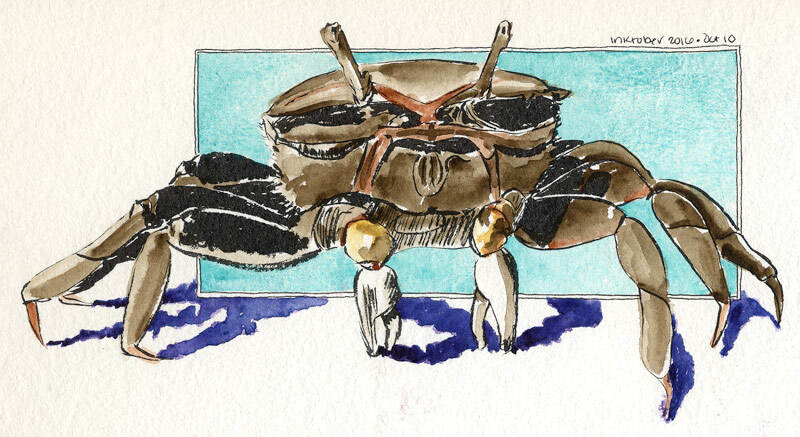 The crabs are about 2″ across the body; the painting is 8.5″ x 4.5″ on Strathmore Windpower 140lb CP paper.